Our next open house is coming up soon, save the date!! 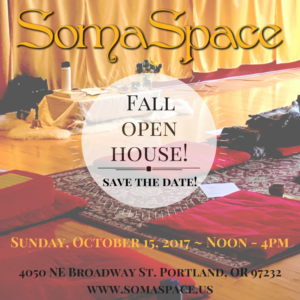 Come to the SomaSpace for an afternoon of free sample movement classes, sound healing, tasty snacks and treats, and community building. There will be opportunities throughout the event to talk to our teachers, practitioners, and staff about our classes, bodywork sessions, and rental opportunities. Learn about the vision and mission, as well as meet a community of like-hearted people. We *love* hearing your ideas around what kinds of events and classes you would like to see more of at the studio! Everyone is welcome! Bring your friends and family out to this fun event. This Open House is our way of celebrating our community, saying thank you for your support of local business, and sharing how we manifest our mission to help people honor embodiment and higher consciousness through practices that create profound self-connection and connection with others and the Earth.